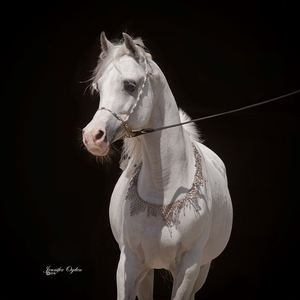 2016: Hadeel will be a very tall and elegant filly, she has black bakc, skin nd will become white quite slowly. She was a bit shy as a younger filly but is maturing to be a filly with confidence and now and then guves us a glimpse of how gorgoeus she wil be one day as a white mare. This is a line of females that produces mostly females but when they prduce a male it is of stallion quality. 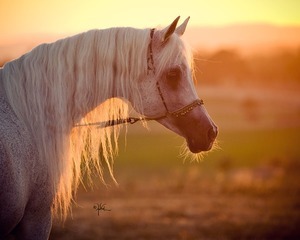 They are good mothers and often become show mares later in life as they gain confidence. Beauitful floating movement with big tail carriage are traits that are cinsstently passed forward. She reminds me a great deal of her granddam, Ansata Haalah. 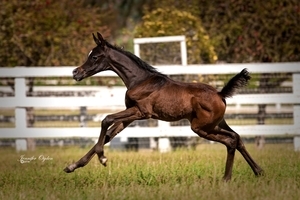 This filly (Song of a Bird) is fullfilling all the promise she first exhibited when she was born last year. Elegant and stretchy with a long fine neck that is beautifully set on a smooth body with a level topline. Her movement is as usual in this family...simply amazing. She is a black grey at the moment and will take time to finish. *Possibly available to a discerning buyer. Once again Henry and I are blessed by Haalani SMF giving us another Symbolic SMF daughter. She is grey and not a bay like the other two full sisters, Hasna SMF and Al Bouraq Haana SMF. Funny but I was sure her dam, Haalani was grey...NOT! Hadeel is a lovely, lovely filly and we are just thrilled with her. This is a special nick between the sire and dam. Haalani is once again back in foal to Symbolic for 2015. Please return often as I post more updates on this filly, Hadeel SMF. Hadeel SMF from Christie Metz on Vimeo.